It’s always a pleasure when we get longtime “SNL” cast member Kenan Thompson playing Steve Harvey in a “Family Feud” sketch, and “SNL” treated us to exactly that again this week in a special edition of the game show in which those who won Oscars last Sunday faced off against those who lost. 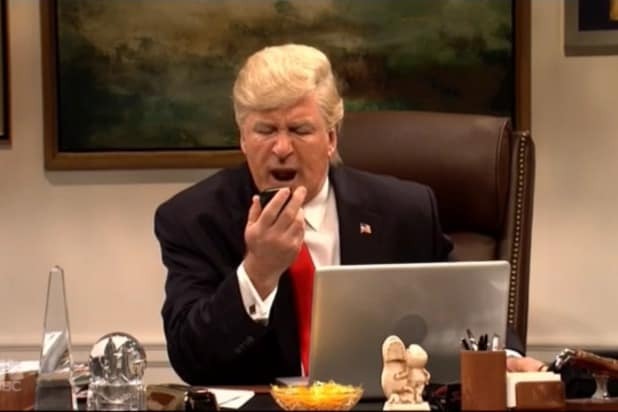 The sketch was chock full of “SNL” stars playing stars, with Kate McKinnon as Frances McDormand, Beck Bennett as Guillermo del Toro, Heidi Gardner as Allison Janney and Chris Redd as Jordan Peele on the winners side, and Pete Davidson as Timothee Chalamet, Melissa Villasenor as Sally Hawkins, Alex Moffat as Willem Defoe and host Sterling K. Brown as Common. “Alright, so your movie is about a lady who gets busy with a fish?” Thompson’s Steve Harvey asked. “A fish monster. Yes. I love my monsters,” del Toro replied. “And it won Best Picture? That sounds like a Wayans brothers movie,” Thompson said. Thompson’s best quip came when he got to Brown’s Common, who he introduced as having won last year’s Best Original Song but losing it this year. “Blessings, yo. It’s an honor to be a part of this family. Despite our feud we still put food on the table, provide for the children, make sure their futures are stable,” Brown’s Common rhymed. “Yeah, okay. OK. Let’s just slow it down there Dr. Martin Luther Seuss,” Thompson quipped. The lone polled topic in the game was “something you do when you get up in the morning.” But it didn’t go so well because they were all too weird to give a normal answer aside from McKinnon’s Frances McDormand, who described a strange morning skincare regimen. You can watch this week’s full “SNL” “Family Feud” sketch in the video embedded at the top of this post, or on the “SNL” YouTube page.